An old Ridgefield mansion that’s now home to Catholic priests was once the country house of a noted racketeer who stole huge amounts of money from the people he was supposed to serve. George Scalise was one of New York City’s top mobsters when he had the misfortune to run up against a soon-to-be Ridgefielder, who exposed his misdeeds, and a soon-to-be U.S. presidential candidate, who successfully prosecuted him. Scalise wound up in jail and columnist Westbrook Pegler wound up with a Pulitzer Prize. According to one historian, Scalise began his criminal career as a pimp, but soon moved into the lucrative field of union management. By 1933, the Brooklyn District Attorney’s office was investigating Scalise for threatening businessmen; by then he was the president of Local 1 of the Car Washers and Polishers Union. He soon became closely associated with mobsters Dutch Schultz and Al Capone and moved on to larger jobs. By the late 1930s, Scalise was the “swaggering president of the Building Service Employees’ International Union,” as one New York newspaper put it. He was arrested in 1940 by the crusading district attorney Thomas E. Dewey, later governor of New York and the 1944 and 1948 GOP presidential candidate. He was charged with extorting $100,000 from hotels and contracting firms his union members worked for. ($100,000 then would be about $1.6 million today.) But the arrest came only after Pegler had exposed Scalise in a series of anti-racketeering newspaper columns that won him the Pulitzer. private arrangement with the officers and without any vote, direct or indirect, of the rank and file chambermaids, charwomen, window cleaners, janitors and other toilers.” The columnist also noted that just across North Salem Road from his Ridgefield mansion was the town poorhouse. Scalise was convicted of stealing union funds and sentenced to 10 to 20 years in Sing Sing. He got out long before the maximum time, however, and by the early 1950s was back in trouble as secretary-treasurer of Distillery Rectifying and Wine Workers Union. He pleaded guilty in 1955 to accepting insurance contract bribes and kickbacks amounting to a half million dollars. He was in prison in 1958 when he was on a list of the top mobsters in New York City. During his “career,” Scalise was suspected in the threatening and killing of various underworld characters, including a New Jersey cohort who had testified against him and was later fed a fatal dose of arsenic with lunch. Over the years, he was also convicted on various extortion and tax evasion charges. 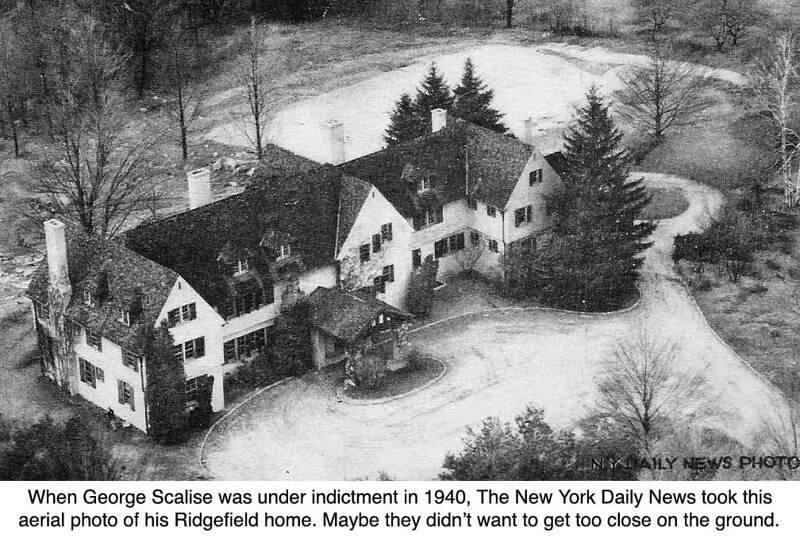 Under fire in 1940, Scalise sold “Villa Scalise.” It soon became the Mamanasco Lodge, a resort operated by the Hilsenrad family, and by the 1960s, it was owned by the Jesuits, who set up a retreat house there and called it Manresa. Today it’s still a retreat house as well as a Catholic school, operated by the Society of St. Pius X.
George Scalise died quietly on July 25, 1989, in Brooklyn. He was 93. Although The New York Times ran more than 100 stories over the years about his criminal activities, and newspapers nationally had literally thousands of accounts of his crimes, none reported his death. By then, the swaggering gangster was a forgotten old man.